Happy Wednesday and last day of August! I'm not going to lie, I've been trying REALLY hard lately to make fall happen here. I know we still have a few more weeks of summer (well for us Floridians, it's more like a few more months) but my little taste of cooler weather while I was in Wisconsin has me ready to break out the booties and flannel. With the few storm systems we have out in both the Gulf and the Atlantic right now we've had a breezy past few days so I decided to take advantage of the ever so slightly cooler temps. This top was one I received in one of my Le Tote (save 20% when you sign up with the code SEQUINS20, code ends today!) boxes and the second I put it on I knew I'd be keeping it. It looks flannel but the material is actually pretty lightweight and I love the zippered shoulder detail. It's the perfect top for the transition from summer to fall and you can't beat the price on it. I wore this outfit during out Fantasy Football draft on Saturday and it was nice and comfy without being too hot. This will definitely be a shirt on massive repeat this fall and I'm not sad about it! And I'm not sorry my Starbucks made a complete appearance in this post either. I haven't had the Starbucks Teavana green tea in forever but when I got it over the weekend I refused to put it down until it was gone. I'm already craving it again today. It's probably a good thing that there isn't a Starbucks within 5 miles of my office or I'd probably be there right now! I am right there with you! I need fall ASAP :) Love that shirt so much! Perfect transition from summer to fall! Really loving this top, so fun and unique! Flannel is where it's at for fall. It's so hard for me to find a flannel shirt that fits though! I have the shortest torso, so even the small ones look like I'm trying to wear them as a dress... which is fine I guess! Have a great last day of August! What a fun top, I love the cut out detail and the back is super cute! It's still going to be hot here for a while, so it's going to be hard to transition into fall anytime soon! I love that this is such a fun twist on a plaid button up! You look so adorable and so fall ready! so much to discuss. number one - that top is friggen cute and i need it in my life :) and yes to all things fall - it looks like the perfect transition piece as you say! and yes to all the starbucks tea. it's my fav thing there. and lastly lets discuss this necklace - so cute! I love that you're trying to make fall happen down in Florida! I'm trying here in South Carolina and it's not quite working. But it will be down in the 60s for lows this weekend (for the first time since the beginning of June) and I am PUMPED. Hurry up, fall! Those zipper details are so fun!!!! Such a great spin on these cold shoulder tops! How cute is that zipper shoulder detail! You look adorable! I LOVE that top! And it can be worn during our "Fall" too, haha! Cute top, lady! Hoping that fall weather finds you sooner than later. I love the cut out shoulders of this top that is so cute! Ohh I love this-- the zipper cutouts are so cool with the classic look of a plaid shirt. I hope you guys don't get too much bad weather with the storms around. Love this top! And girl I am with you on fall. It's been so hot here lately! Fingers crossed for cooler weather soon! Loving that top, girl! I love the zipper cutouts, so unique. And the nail color you are wearing...love!! How cute is this shirt?! I love the zip cold shoulders and the back slit -- such great details! This is the perfect top for transitioning to fall! What different take on a plaid shirt. Love the could shoulder detail. Pretty look. Gah...I wish it were cooler (though all this Florida rain is making me chilly. Haha). 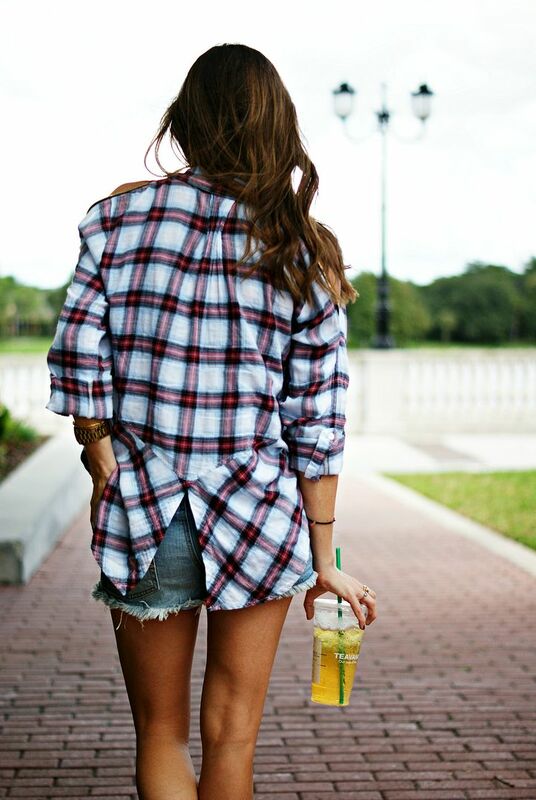 Love that you paired this plaid with shorts to get the best of both worlds! How cute is that top?! You look fab! That zipper detail is so different and neat! As always, loving your outfit! cold shoulder and plaid - two of my most favorites! I don't usually like plaid, but I think you made it look good with this outfit! I think it's one of those things where some people can do it (such as you), and some people can't. The zippered shoulder are SO fun and give it a unique touch! I need more flannel in my closet! That top is SO cute! I love the open shoulder and that it isn't actually flannel! what a cute top! definitely great transition piece especially somewhere like FL where you all have to wait a few more months for fall :) and how cool that it's not actually flannel. definitely my kind of flannel haha. What a fun spin on a flannel! Love the open shoulders! I'm looking forward to fall weather too! That shirt really looks like it would be a heavier weight material, but the fact that it's lighter weight makes it perfect for summer or fall! The zipper shoulder detail is so cute too! I want this plaid for the beautiful shoulder. I love plaid, but i have wide should so i give up plaid skirt, and this one is the one i am looking for.